FutureAdvisor is a registered investment advisory firm, which offers portfolio management services. The firm uses automated tools to analyze your portfolio compared to a model portfolio, and makes buy and sell recommendations to align your portfolio with its ideal. FutureAdvisor offers you the opportunity to connect with a real person to answer any questions. The firm creates ETF-based portfolios and offers portfolio rebalancing and tax-loss harvesting services, like Betterment and Wealthfront. But at FutureAdvisor, you reveal your investment holdings in your IRAs, 401(k) plan, and taxable accounts, and the firm seeks to create a diversification plan across your various accounts whereas some robo advisors create a diversified portfolio only with the money you invest directly with that firm. If you choose its premium services, the firm executes trades on your behalf but you keep your investment accounts at a brokerage firm that acts as a custodian (either TD Ameritrade or Fidelity). Otherwise, you can use the free services to analyze your portfolio. The firm invests according to its interpretation of the Modern Portfolio Theory (MPT) and Fama-French Three Factor Model. The first (MPT) proposes that there is an efficient frontier in which investors can receive the maximum return at a given level of risk, which is determined based on individual risk tolerance, time horizon (years until retirement), and age at FutureAdvisor. Based on this information, the firm starts its portfolio recommendation process by proposing a stock-bond mix. Further, the firm holds to the idea that you should invest in low-cost ETFs because they are tax-efficient and have minimal fees. There are free and premium versions of the portfolio management service. Do-it-yourself aka self-directed investors who seek guidance can use the portfolio analysis tools to identify potential areas of weakness, compared to a model portfolio created by the advisor. The firm indicates sell and buy recommendations that the self-directed investor can execute in order to build what FutureAdvisor names as a diversified, tax-efficient, low-cost portfolio. The premium version of the portfolio management service costs .50% of assets under management (AUM) plus the cost of trades made on your behalf. Note that if you allow FutureAdvisor to manage your money, you must have an account with TD Ameritrade or Fidelity; the firm facilitates a move to these brokers if your accounts are not already there. The possible advantage of using the premium service is that trades are executed on your behalf, including trades made for tax-loss harvesting and rebalancing purposes; therefore, you are not troubled with many day-to-day decisions. There are no minimums to use the free service. You'll need $10,000 in investable assets to open a premium account. Start by signing up for a free account with FutureAdvisor. Next, you'll need to gather and enter information about your current holdings, including whether an account is taxable or tax-advantaged, such as an IRA, Roth IRA, etc. There are two main ways to enter information about your current portfolio: 1) link your accounts to the FutureAdvisor site (for example, enter your username and password with Vanguard, and your information will automatically populate your portfolio balances) and 2) manually enter information about your holdings. Then, you'll respond to prompts about your plans for retirement (specifically, enter your current age and the age you plan to retire) and whether you have a conservative, moderate, or aggressive risk tolerance. Note that the weighting of stocks to bonds increases as your tolerance for risk increases. Based on your inputs, FutureAdvisor will provide a Target Portfolio and formulate an action plan that allows you to achieve this targeted asset allocation among your investment holdings. You'll also receive a score of your current portfolio in the areas of performance, diversification, fee efficiency, and tax efficiency. You can view the target portfolio along with key statistics that include inflation-adjusted projections of annual performance under average and poor market conditions. Note that Domestic Value is weighted the same as Domestic Total Market and the Foreign Value is similar to Foreign Total Market; Small Caps, both Domestic and Foreign, are featured prominently; and there is a relatively high weighting of Emerging Markets. Aligned with FutureAdvisor's investment philosophy, this weighting tilts toward small caps and value stocks. And I should also mention that the weighting is heavier towards equities (stock funds) because of my aggressive risk tolerance and the firm's bias toward stocks, which have historically outperformed bonds in the long term. PerformanceFutureAdvisor provides a letter grade (A to F) and a performance analysis, which consists of a backtest and forecast as well as performance over the last one and three months. The forecast is based on historical data and future performance may or may not replicate past behavior. Backtesting is a tool that others may find useful. There are a couple of concerns I should mention in regard to backtesting. For starters, the portfolio you have right now may not resemble the one you had several years ago; that is, you may have bought and sold stocks intelligently but your current holdings may not have performed well during a time in which you did not own those particular stocks, possibly making the backtesting irrelevant. Also, the target portfolio is designed based on past performance, so generally such a portfolio will outperform ones that didn't incorporate historical information to create. Still, it was interesting to see how my portfolio moved similarly to the target portfolio but did not deliver as high returns; however, my holdings outperformed the targeted one over the past one and three months. My 401(k) was not included in the analysis. DiversificationYou receive a diversification analysis, which gives you a broad view in terms of stocks/bonds mix as well as detailed information relating to diversification in global funds, REITs, inflation-protected bonds, small cap and value funds, etc. Fee EfficiencyYour holdings are rated on their fee efficiency. Details on what makes a fund efficient are not detailed but presumably your portfolio can be fee-efficient by purchasing funds with low operating and marketing expenses, no sales loads, and no transaction fees. My portfolio was so fee efficient that I was told that I had the flexibility to spend more for diversification. Tax EfficiencyIndividual holdings are analyzed to determine tax efficiency. For example, you might want to hold a mutual fund with high portfolio turnover in a tax-advantaged account to avoid having to pay capital gains when holdings are sold. To help clients better understand recommendations for moving holdings among accounts, FutureAdvisor provides a link to this article on the principles of tax-efficient fund placement. FutureAdvisor offers specific buy and sell recommendations for each holding in each account that you own. So, you can view the ETFs that FutureAdvisor recommends. You can implement recommendations on your own as a do-it-yourself investor. But you can also sign up to receive premium services for a relatively small fee (.50% of AUM). These extra services include transitioning your current portfolio to a tax-efficient one and trading to build this new portfolio in a tax-aware way. If you are getting started in investing and have all of your money inside of IRAs, then then tax-efficient and tax-aware methods are generally not going to add value. The firm can simply sell certain holdings and reinvest in its recommended ones. However, if you have investments in taxable accounts only or a mixture of taxable and tax-advantaged accounts, then the firm will employ a strategy that considers your tax situation. According to its FAQs – Taxes, FutureAdvisor indicates that trades on short-term capital investments will be made that trigger only up to $250 in taxes, and long-term holdings will be carefully sold, drawing on a variety of factors. You can also manually control trades by locking certain investments to prevent sales (click on the unlocked icon next to a holding to “lock” the investment). Note that if you currently do not have investments or do not wish you to receive a portfolio analysis, you may simply sign up for FutureAdvisor by funding an account at TD Ameritrade with a minimum of $3,000 and a maximum of $100,000. There are several good and useful features associated with a FutureAdvisor account. Free services and low fees. You can sign up and get the portfolio analysis at no charge. The grades and details about those grades can help you pinpoint potential problems and give you ideas on how to deal with those problems. For example, I hadn't paid much attention to the cash balance in one of my accounts and now realize that I should go ahead and invest the money. If you decide to use premium services, the fee is relatively low (.50%) compared to traditional advisors. Portfolio Analysis. The model portfolio is useful if you are seeking to replicate the firm's diversified portfolio. At a glance, you can identify segments in which to increase your exposure. For example, you may realize that you want to increase your holdings of international stocks or inflation-adjusted bonds. FutureAdvisor also recommends specific funds to purchase, so you can implement portfolio changes on your own without incurring an AUM fee; you may reject certain recommendations and view updates. After making trades, you can view how your current portfolio is aligned with the model one. You can receive 401(k) portfolio design advice (however, note that this advice treats the 401(k) as a distinct portfolio and doesn't integrate plan holdings with the portfolio analysis). Tax efficiency. The firm seeks to place tax-efficient investments inside taxable accounts and not-so-tax-efficient ones inside tax-sheltered accounts. In addition, the firm employs strategies to help control your tax bill. There are a couple of areas in which FutureAdvisor falls short, compared to its promises of holistic portfolio analysis and tax-efficient recommendations. Portfolio analysis excludes 401(k). The firm purports to analyze your entire portfolio (except what you intentionally exclude) but didn't include the 401(k) balance I had added manually. This exclusion negated the purpose of getting a comprehensive view of my portfolio. In my case, most of my international funds are held inside my husband's 401(k). Instead of giving us credit for holding international funds in the portfolio, FutureAdvisor suggested that I invest in a Target Date fund. This recommendation not only would result in higher fees but could also counteract my portfolio diversification process. Individual stocks are not recommended (ever). Optimistically, I expected that my stocks would be classified according to capitalization (large or small) and style (growth or value) and then included in the portfolio analysis, and trades recommended to bring the portfolio into alignment with the target. However, the recommendation that I received was simply to sell all stocks and invest in ETFs because FutureAdvisor doesn't invest in individual stocks. Inaccurate classification of IRA. Finally, one of my accounts was inaccurately classified as taxable in some sessions, leading to a misleading recommendation to purchase a more tax-efficient fund. There are a few things you should know about FutureAdvisor to understand its potential role as part of an investment strategy. Retirement planning focus. FutureAdvisor focuses on retirement planning and more recently college education, but not necessarily wealth accumulation in general or investing for long-term goals involving extended travel, a vacation home, or downpayment on a primary residence. However, if you have an account that is designated for a non-retirement purpose, you can eliminate that account from the portfolio analysis. Trading fees are charged. You'll incur trading fees but most funds FutureAdvisor buys are available commission-free. Greater emphasis on small cap and value investing. The portfolio's emphasis on small cap and value stocks will likely lead to performance that is not closely aligned with the broader U.S. stock market, possibly underperforming in some years and outperforming in others. The firm reports actual client performance (aggregated) on this page. 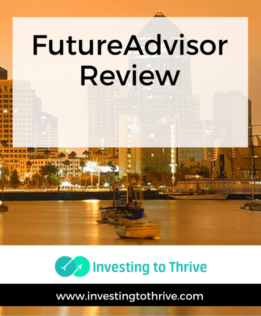 Investors who are interested in automated financial advisory services may consider FutureAdvisor for retirement portfolio management. Self-directed investors may want to investigate the firm's portfolio analysis capabilities but should realize that the tools are useful but not perfect.